So, if you’ve followed along on Facebook, you’ve heard how I’m not a big fan of vegetables this pregnancy (or last one, though the things I do like are completely different!). I like to be healthy though, so I’m finding ways to sneak them in on myself, especially now that even fruit doesn’t sound great. If you know me, you know that that is just plain crazy for me! I adore fruit! I know they say no one is obese because they ate too much fruit, but I do have to (usually) reign in how much I’d eat otherwise…it is nature’s candy after all! 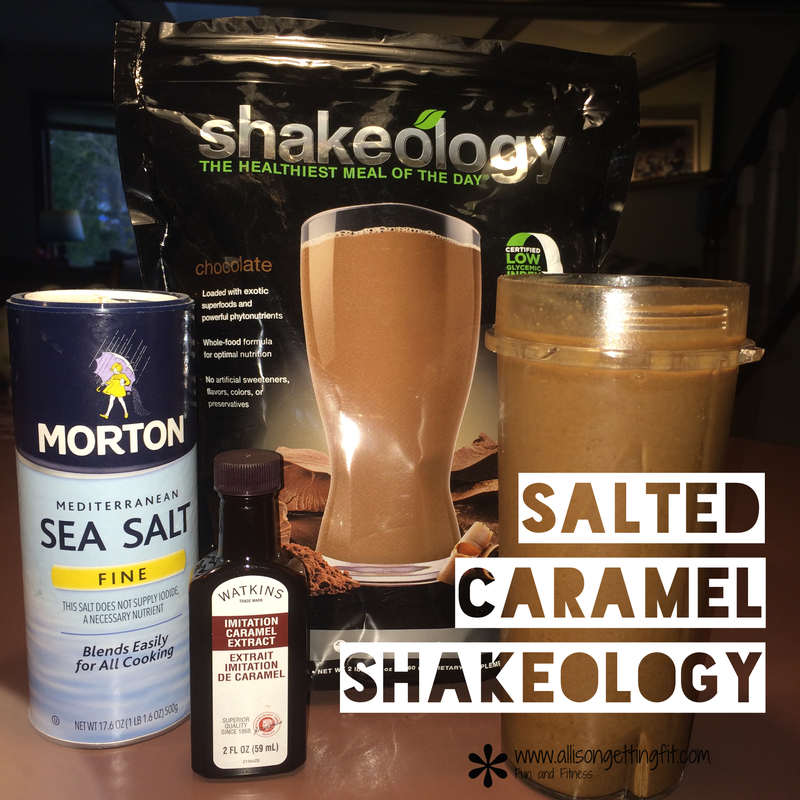 Enter my new Shakeology recipe (if you can call it that!). I’m usually a plain Shakeo, ice and water kind of gal (because I’d rather eat my fruits and vegetables separately…love volume! ), maybe with a flavor extract. But now that I’m just not eating them, it’s been a great way to sneak them in! And when I finish it…oh boy! I feel refreshed and rejuvenated with so much more energy than before I drank it. This is a true testament to fueling your body WELL, with the right foods. Something I’m having such a hard time stomaching right now. The frozen cherries work as ice too here…which is why if I do put fruit in my shake, it’s frozen! It can be hard to fit fruit and ice in a single serve blender cup! I love this shake, and the way I feel after it. It’s become my daily go to, at least until I feel up to more variety in my foods. Do you have a favorite shake recipe? Share it! I just had a birthday! My daughter and I share, so there was cake and a bunch of other out of the ordinary treats, but I kept up my shakeo habit because I know it helps! I definitely made better choices than I might have! What does Shakeology do for me? Kills cravings, fills me up, doesn’t weigh me down (I have it before evening workouts!) and makes me feel generally amazing with energy and no crash. I LOVE birthday cake/funfetti stuff. So good. And this shake was just what I needed. It was more than the nothing I usually put in my shake (Shakeology, water, ice, maybe a boost or 3), but still healthy! It also was super thick…a real dessert-like treat! Top with sprinkles, especially if it’s your birthday!! Yes, I put all of those awesome words together, made a snack from them, and then enjoyed the results! But let’s go back! I had plans to meet up with a local group of moms last night for a paint night…have you been? You get together, drink a bit, snack a bit, chat a bit…and oh yeah, paint! It was a great way to meet up with people for the first time (if you remember, I just moved to a new state!) since there was an activity and snacks! I had a great time, and painted something that has in fact made it onto my fairly bare walls. But I wasn’t too sure what to bring. I like to bring healthy things to share so I know that I can stick with what I brought and stick to my goals, but I also like to bring delicious things! 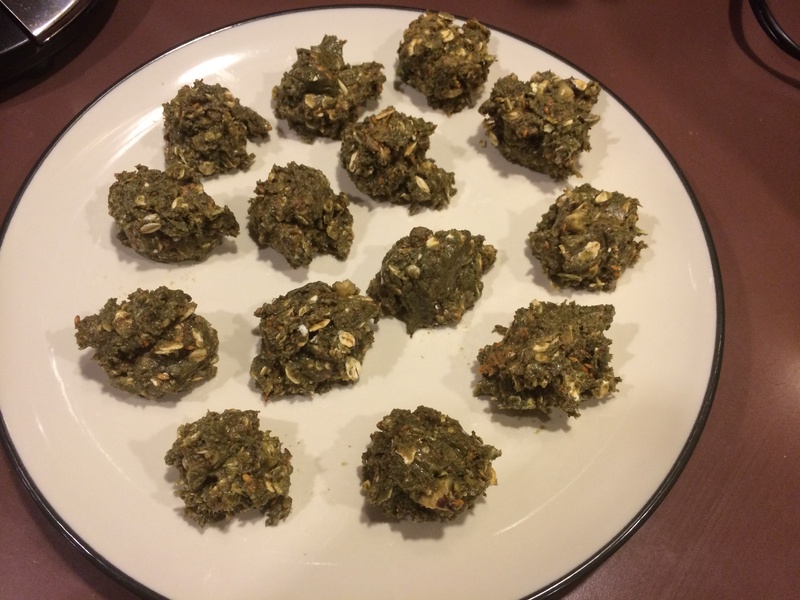 I don’t want to be someone who brings stuff that tastes healthy to gatherings! I want both healthy and tasty. I had originally planned for zucchini chips and spiced nuts. 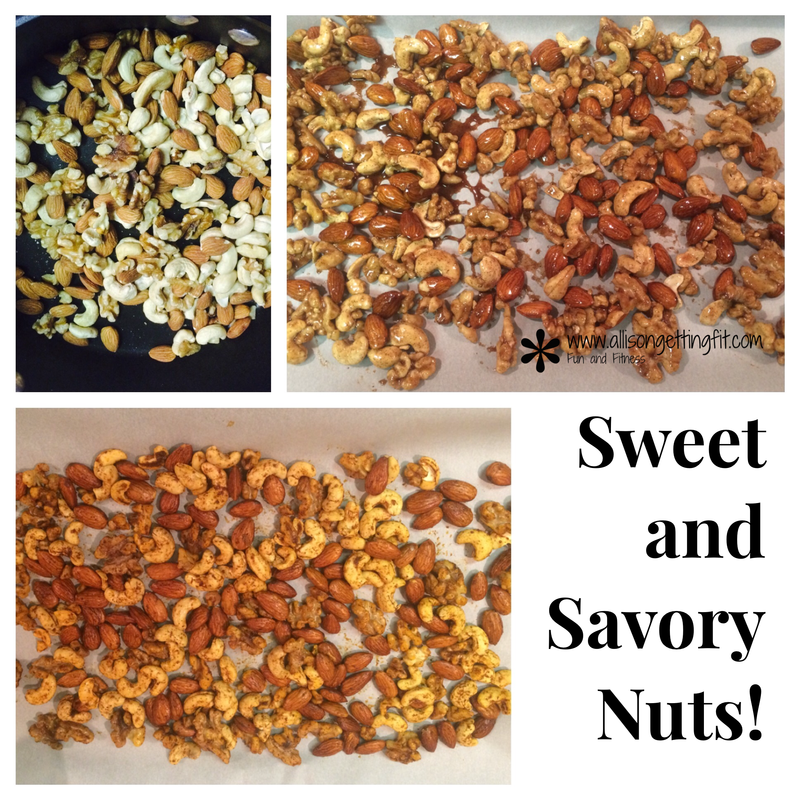 The spiced nuts from the Fixate cookbook came out amazing…I think I’ll be making these for my blue containers all the time. I made them two ways and brought the savory ones, which had smoked paprika and chili powder on them. But when it came time to make the zucchini chips, I knew they weren’t what I wanted. I was in the mood for chocolate! So I figured I’d make something chocolaty, that I knew was good for me, and that would help me stay away from other foods! It’s all about knowing yourself and planning. They came out so good that I don’t know if I can have the rest in my house! So, you want to make these yourself? I know! 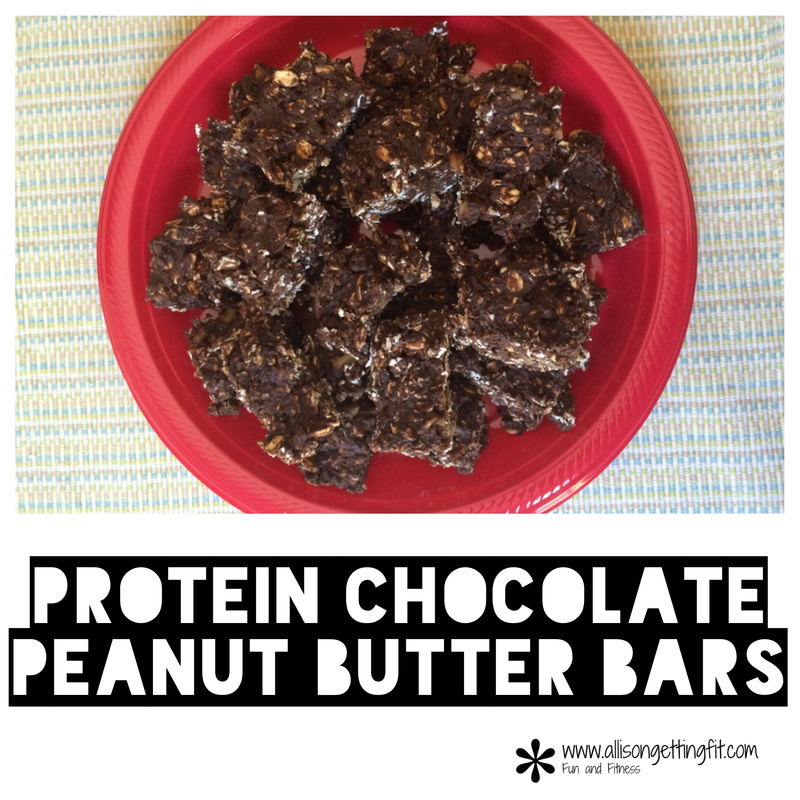 Here’s the recipe, which I adapted from the 21 Day Fix nutrition guide. I made it more of what I liked, and as a bonus, I had all of the ingredients at home! This was super good…chocolate, vanilla, and coffee all rolled into some icy goodness! It wont go replacing my salted caramel shake, but it’s up there. I saw a recipe for this that turned out well, but wasn’t perfect for me. The crazy thing is…I took out the milk! And I liked it much better. Plus, that means that it counts as just a red on the 21 Day Fix! Just put them together and blend…and enjoy! So, you’re wanting a reasonably healthy cake substitute without leaving your house? 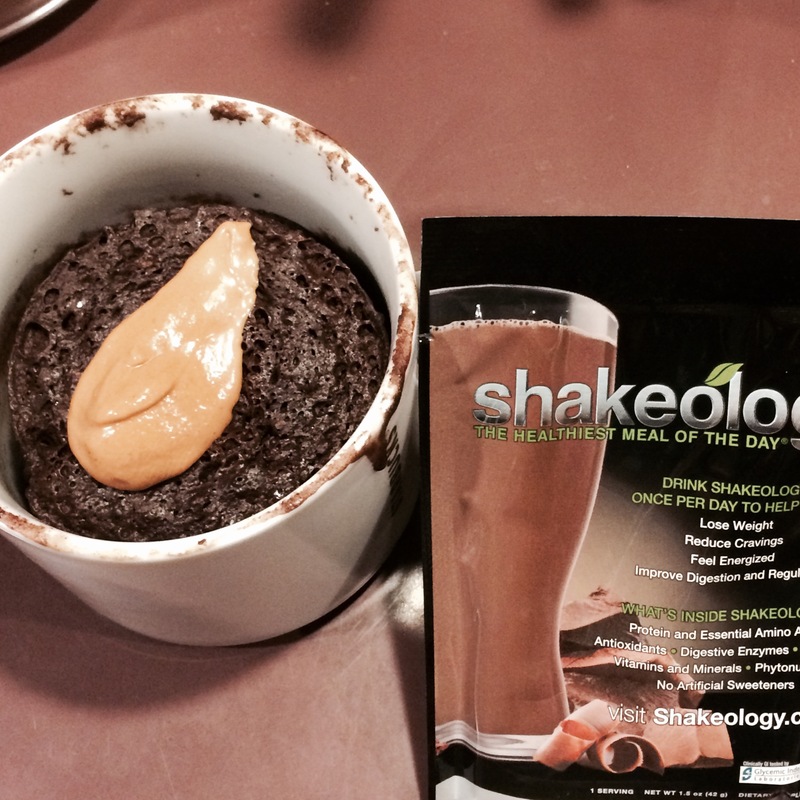 Shakeology mug cake to the rescue! I made this from things I had, nice and easy, and topped it with peanut butter (it is natural, just peanuts, but super smooth. I actually prefer a little texture, but this is the best my food store has!). 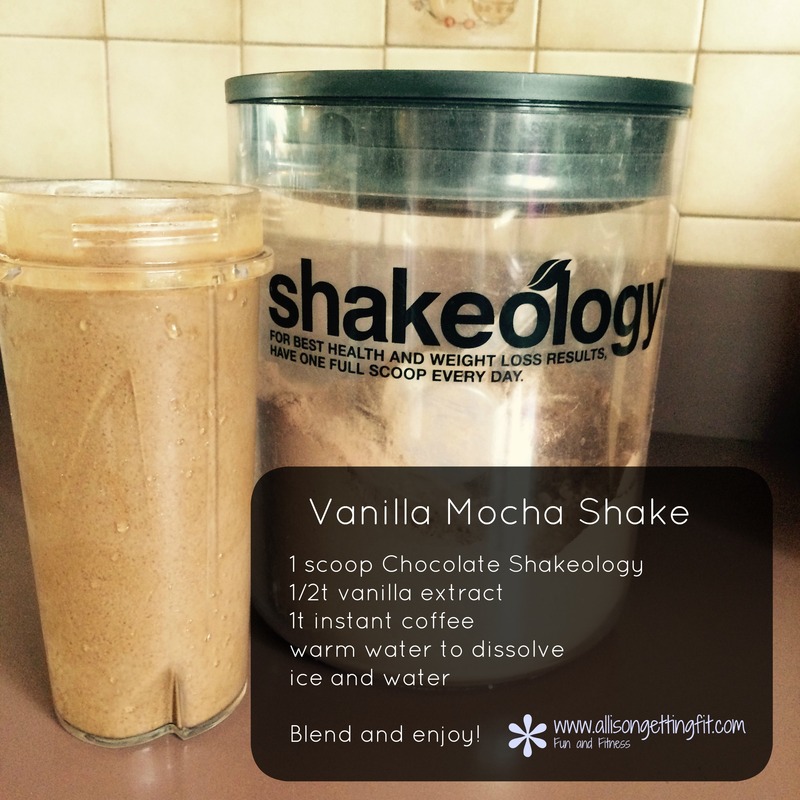 – 1 serving Shakeology – I used chocolate, but next time I’m going to try vanilla! Combine dry ingredients. Add wet. Mix until all dry ingredients are wet. Microwave for about 90 seconds – mine took about 75. The edges will come away from the sides of the mug when done. Top if you like! And enjoy. I love single serving desserts. No leftovers tempting me. What about you? Make a bunch or just one? Have you used coconut butter before? I keep it on hand because it is delicious and cool. It melts when warm and is a solid when cooled. Do you remember that magic shell stuff for ice cream? This gives the same effect, but is a lot better for you! I made this recipe the other day. Wow. It was delicious! 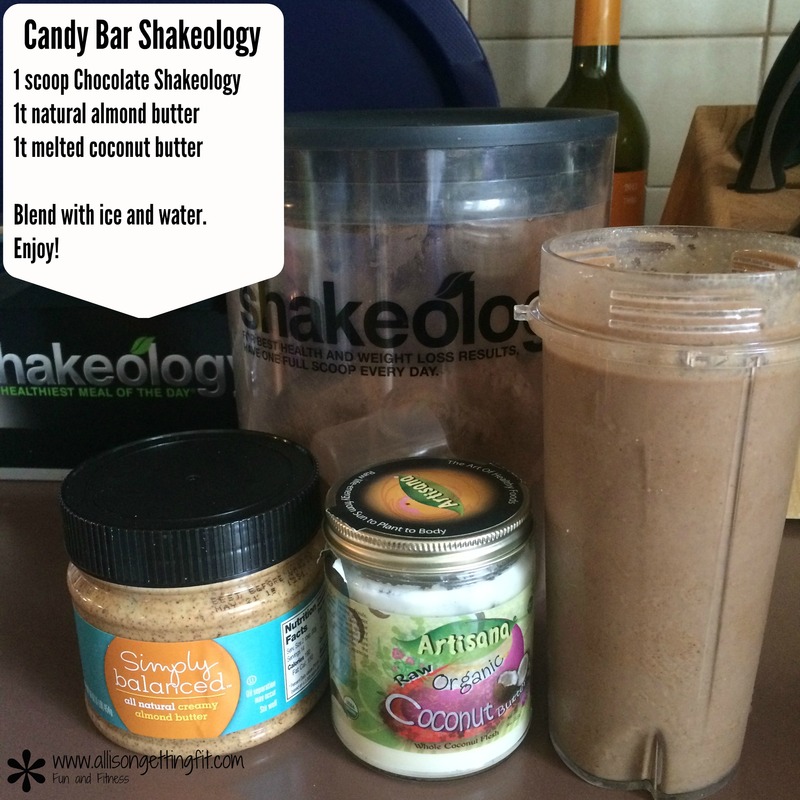 Now, I drink Shakeology because I love it…energy, no crash, keeps me full, makes me feel healthy. So, yes, my recipes use it! If you drink something else, feel free to try it out in this! I find that when I blend Shakeology with ice it has this amazing sharpness that I adore, so that may not come through. But this recipe is so good, that I do not want lack of my favorite meal replacement to prevent you from trying it! So, it’s simple…ice, water, Shakeology, almond butter and MELTED coconut butter…definitely melt it first so that it has a chance of being dispersed in the shake! And I add it last so it doesn’t harden too much before mixing. Have you tried coconut butter? I’ve moved my Shakeology! Where did it go? To the afternoon! This opens up my time to try out some new things. When I have it early, I’m still in a bit of a haze and just go for the water and ice. Afternoon, I am up and more adventurous! So I’ve been playing a little with cookie-esque recipes and am loving this one. If you like the chocolate and mint combo, this is a must try! Just be careful with the mint…it gets overpowering quick! This fits into the 21 Day Fix as a red and a yellow if you’re wondering. I have been using the 21 Day Fix (link to my wrap up of the first round) meal plan since it’s release in February. I have done the nutrition plan with and without the workouts and it is my favorite all-around plan…everything you need to build healthy habits. This month, it is discounted…in both English and Spanish. If you know me, you know I don’t stop talking about how much I love the 21 Day Fix plan. The nutrition plan has completely changed the way I eat and (re)taught me the portions I need of each type of food. I find it so easy to follow! I’ve been even using the nutrition side with my Body Beast workouts. The workouts are solid also, which was the biggest surprise to me. You get 7 workouts (one for each day! ), 30 minutes each, that are simple yet effective. Autumn is a great motivator and you’ll find yourself quoting her quickly! Love it! FYI – The 21 Day Fix en Español is dubbed, not subtitled. So no need to read the screen! The discounted pack comes with the nutrition plan, containers for measuring (and packing into…they come with tops! ), the workouts, and starts off Shakeology (can be changed or canceled any time). You also get an extra workout for ordering through me, plus the money back guarantee as always! And me to give you motivation along the way! If you’re looking for some all around health and fitness help, you can’t ask for much more! Talk to me about getting discounts on those future months of Shakeology too. We are almost up to two years of daily Shakeology and can’t go without it! Add all ingredients to bowl and mix well. I made 15 balls that were a good size (similar to the size of my chocolate ones that make 12 in the recipe). Freeze and enjoy! 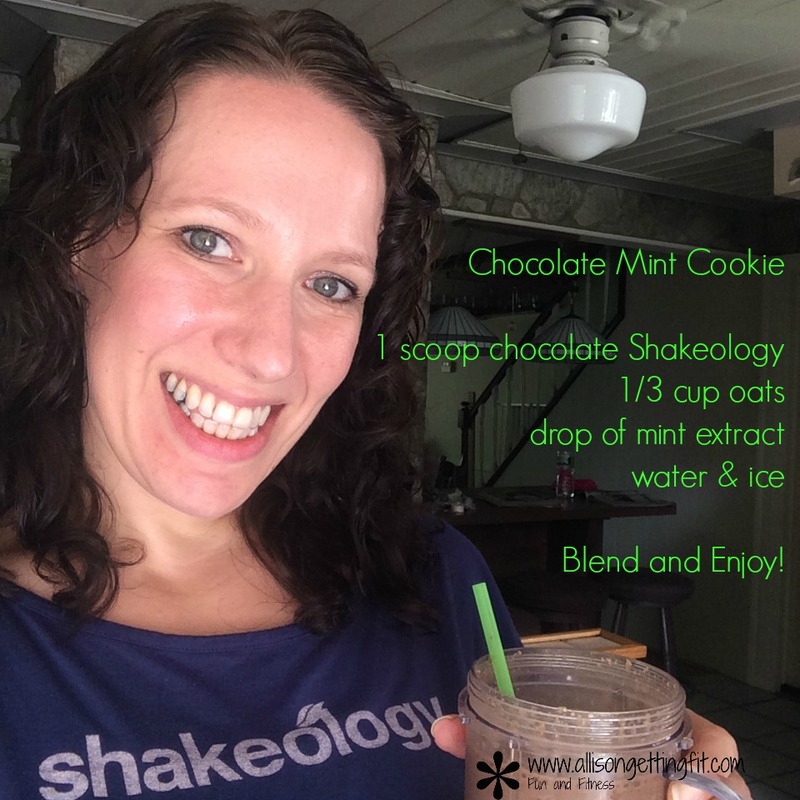 Want to know more about Shakeology? You can check out the page above or go here!